Colleen is no stranger to winning. Colleen who hails from Pickering Ont. Canada has won over 80 Highland Dance Championships throughout Canada, USA and Great Britain. Se is 10 time and current Ontario and Canadian Champion. 1989-98. Six time current Commonwealth Champion. 1991-97 North American Champion, 1995,98. Eight time and current Great Lakes Champion 90-98. Colleen lists of accolades don't stop there. Apart from her prestigious wins at Cowal. "Dancers" readers will remember Colleen was also this year YTV Achievement Award Winner. Competitive dancing is not the only pastime with this young lady. She is an honour student and student in the High Performance Athlete Program at Dunbarton High School. "Also over the past two years I have performed with the Scottish Dance Company of Canada. Twice at Roy Thompson Hall "Celtic Christmas" The main production of the dance company's "Imrama" has been performed in Ottawa and Arizona". The youngest member of "Celtic Accent". Colleen has traveled with the 78th Fraser Pipe Band to Toronto, Chicago, Ottawa, and Guelph and on to Ireland this summer. The British Broadcasting Company (also know as the BBC) featured Colleen in a documentary entitled "EX-S That Fling Thing" which has aired frequently throughout Britain. "As well as competing throughout the year and being a member of both dance companies, I also perform with my dance school at private and community functions, which have included the Calgary Stampede, McKenzie House, the premier showing of the movie ROB ROY" The Ontario Office of Protocol invited Colleen to attend a young achievers luncheon with Queen Elizabeth during her Ontario visit last year, however Colleen was also chosen to sit at the head table with Her Majesty. Quite a resume for one so young, and I would say a very busy life, but Colleen does not stop there. Apart from Highland Colleen also studies ballet, modern dance, hip-hop, jazz and Irish Step dancing. "I love the Highland because of the intricate technique. When you dance there is so much to think about, so much going through your head the whole time. I especially like the power and stamina that Highland Dances demand. I like the National dances, but I "LOVE" to do the leaps and Highcuts! It's true with other forms of dance you can adjust the dance to your body, but in Highland you have to adjust your body to the dance and you have to have stamina, otherwise it just doesn't happen". 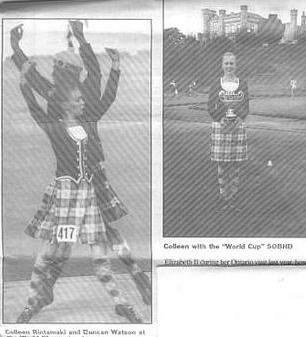 Colleen leaves this week (Aug 98) for Cowal to defend her title but her long term goal "is to continue to strive to be a better dancer, to teach and eventually judge and to try and bring Highland into the public eye so that it can be recognized for both the sport and dance form that it is". Personally I would say that Colleen is well on her way to reaching that goal and Highland Dance has in her a great Ambassador. There are many young people striving for their own personal goals, who work diligently for their art, sport or particular interest. You will find a lot of them within the pages of "Dancer". There are the parent, teachers, friends who love and support them. In their own quiet way who make this world a happier and more interesting place. Thank you to all the dancers who give so much enjoyment.